We got to the orphanage - which I will refer to as Tumaini for the rest of this - it was already pretty late, so most of the kids were already out of school. We put our bags in our rooms, which were in Rose's house, and headed outside. 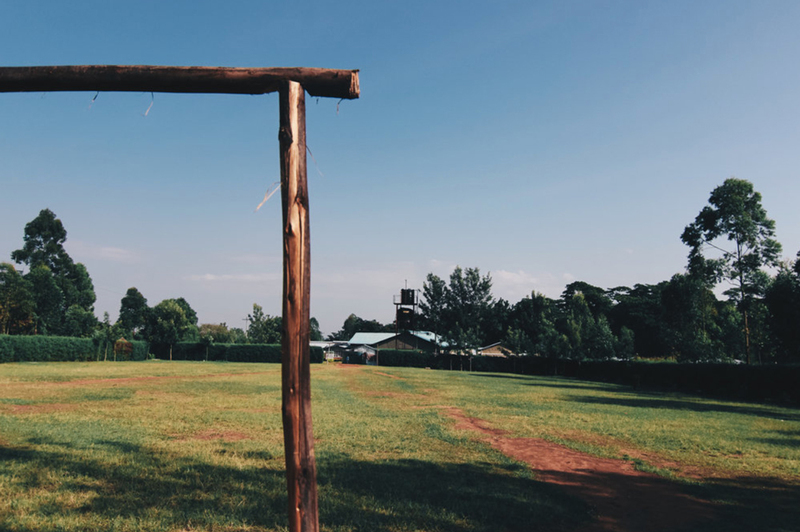 Tumaini is one really big, beautiful piece of land that has a school for grades pre-k to eight, a home for them, a soccer field and a Rose's house. Rose is head "momma" because she started Tumaini many years back. Rose and I spoke back and forth through email before I came to Tumaini in order to set up the soccer details of the trip. To say the least, Rose is one of the most incredible people I have EVER met. Her intelligence is unmatched, her heart is huge and her drive and passion are inspiring. After growing up in a poor home, Rose was given the opportunity to go to school and then from there, passed the opportunity along to others until she had created Tumaini. I mean this woman literally moves with grace and knowing her is a privilege. After finally meeting her face to face, we headed out to the field where the kids were playing red rover and tag. Me, having absolutely no will power when it comes to cute newborns, gravitated towards the "nursery" part of the building. I say "nursery" lightly; a clean, bright room with flowers is not exactly what it looks like. Never the less, the babies were being taken care of by house moms. I picked up a little boy named Thompson and he fell asleep in my arms. I quickly learned every single kid here is loved and cherished immensely by Rose and her staff. Their upbringing was translated through their polite and loving personalities and interactions with us right away. I left baby Thompson in a friend's hands when I saw the soccer ball come out though. But were we expecting anything less? NAHH. I walked over to the boys and started throwing high fives "goata, goata, goata" - a sign of greeting in Tumaini. "Can I play?" "Of course!" Polite AND good english? Honestly, shout out to Rose, these kids rock. After a little shuffling around, I got everyone in a circle. The first rule I ever learned on these soccer trips? You've got to earn your respect on the ball field. You're on their turf. (Especially being a girl). So basically, if I'm gonna hang with the big dogs, I've got to to show them I have tekkers (in soccer terms, that means skills). So here I am, all 5 ft 10 of me with my cute little Nike shorts and hair in a side braid, telling these little Neymars to bring it on. They passed me the ball and I flicked it up and whipped out every juggling skill I knew. They. went. nuts. Respect earned - game time. We laughed a lot as the ball bounced back and forth between end lines for an hour. I didn't speak swahili but we were all talking: if you get that. At one point in those minutes, I stopped to look at Jordan with a huge smile on my face and said "this is amazing. We're right where we're supposed to be. I think we'll be back soon." It seems so crazy to me that I felt that connection so instantly, but I truly did. The best part of this was that when I turned away from Jordan, the young boy next to me nutmegged his defender and turns around to me and says "I'm taking your style." Basically that boy and me, who I would soon learn was named Pheniox, were friends from that moment. After that game we tucked it in for the night. The jet lag and the footy did me in and I was knocked by 7:15.